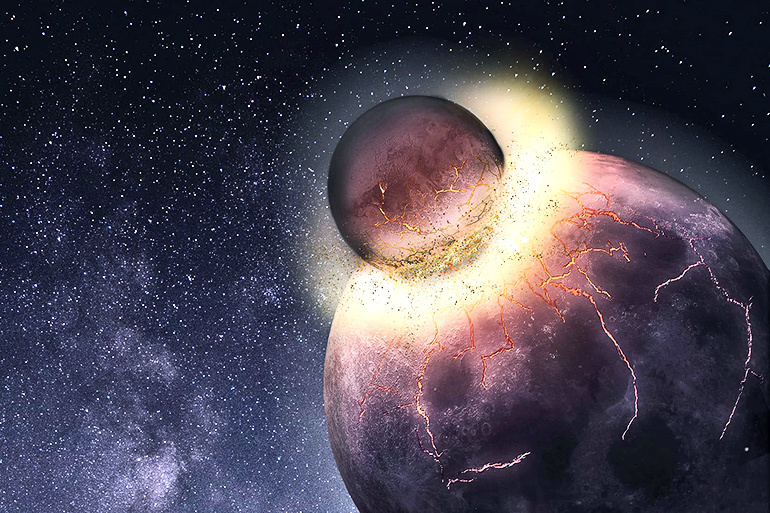 Earth most likely received the bulk of its carbon, nitrogen, and other life-essential volatile elements from the planetary collision that created the moon more than 4.4 billion years ago, according to a new study. “From the study of primitive meteorites, scientists have long known that Earth and other rocky planets in the inner solar system are volatile-depleted,” says study coauthor Rajdeep Dasgupta. The researchers compiled the evidence from a combination of high-temperature, high-pressure experiments in Dasgupta’s lab, which specializes in studying geochemical reactions that take place deep within a planet under intense heat and pressure. In a series of experiments, lead author and graduate student Damanveer Grewal gathered evidence to test a long-standing theory that Earth’s volatiles arrived from a collision with an embryonic planet that had a sulfur-rich core. The sulfur content of the donor planet’s core matters because of the puzzling array of experimental evidence about the carbon, nitrogen, and sulfur that exist in all parts of the Earth other than the core. Grewal’s experiments, which simulated the high pressures and temperatures during core formation, tested the idea that a sulfur-rich planetary core might exclude carbon or nitrogen, or both, leaving much larger fractions of those elements in the bulk silicate as compared to Earth. In a series of tests at a range of temperatures and pressure, Grewal examined how much carbon and nitrogen made it into the core in three scenarios: no sulfur, 10 percent sulfur, and 25 percent sulfur. Using this information, along with the known ratios and concentrations of elements both on Earth and in non-terrestrial bodies, Dasgupta, Grewal, and postdoctoral researcher Chenguang Sun designed a computer simulation to find the most likely scenario that produced Earth’s volatiles. Finding the answer involved varying the starting conditions, running approximately 1 billion scenarios, and comparing them against the known conditions in the solar system today. “What we found is that all the evidence—isotopic signatures, the carbon-nitrogen ratio, and the overall amounts of carbon, nitrogen, and sulfur in the bulk silicate Earth—are consistent with a moon-forming impact involving a volatile-bearing, Mars-sized planet with a sulfur-rich core,” Grewal says. Dasgupta, the principal investigator on a NASA-funded effort called CLEVER Planets exploring how life-essential elements might come together on distant rocky planets, says better understanding the origin of Earth’s life-essential elements has implications beyond our solar system. “This study suggests that a rocky, Earth-like planet gets more chances to acquire life-essential elements if it forms and grows from giant impacts with planets that have sampled different building blocks, perhaps from different parts of a protoplanetary disk,” Dasgupta says. Dasgupta says it does not appear that Earth’s bulk silicate, on its own, could have attained the life-essential volatile budgets that produced our biosphere, atmosphere, and hydrosphere. The study appears in Science Advances. NASA, the Deep Carbon Observatory, and the David and Lucile Packard Foundation supported the research. CLEVER Planets is part of the Nexus for Exoplanet System Science, or NExSS, a NASA astrobiology research coordination network dedicated to the study of planetary habitability. CLEVER Planets involves more than a dozen research groups from Rice; NASA’s Johnson Space Center; the University of California, Los Angeles; the University of Colorado Boulder; and the University of California, Davis.